1792 In Britain, Mary Wollstonecraft demands equal rights for women. 1793 The last woman in Europe to be executed for witchcraft is burned. 1792 Goya travels to Andalusia; he falls seriously ill and loses his hearing. 1793 Paints small cabinet pictures. 1793-94 In France, the Terror rages under the Jacobin Robespierre. 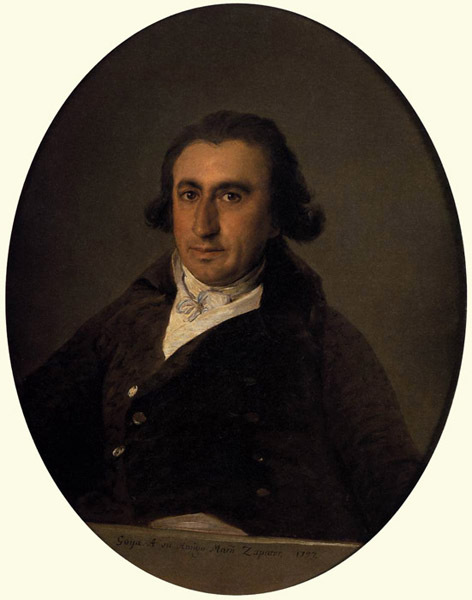 1795 Death of Goya's brother-in-law, Francisco Bayeu. Appointed Director of Painting at the Madrid Academy. First portrait of the Duchess of Alba. 1796 Stays at the country seat of the Duchess of Alba in Andalusia. 1797 Back in Madrid in April. Starts workon the Caprichos. Withdraws from his teaching obligations at the Academy because of his deafness. 1798 Construction of the first high-pressure steam engine. 1798 Paints frescoes in the church of San Antonio de la Florida, and an altar painting for Toledo Cathedral. 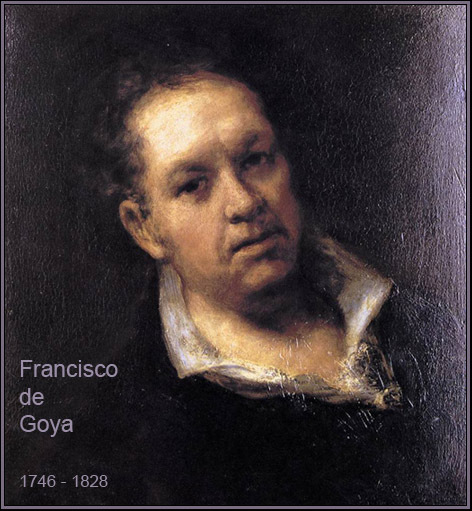 The year 1793 marked a significant change in Goya's career. A severe illness provoked a physical and mental crisis that changed him permanently. The illness left him stone-deaf. The proud society painter, confident and daring, became a man who looked at reality with a far more critical eye. Deafness made him mistrustful of people, but also sharpened his visual perception. He could no longer ignore life's darker side - and no longer wanted to. As a result he began taking the internal world of his imagination increasingly seriously. A passionate affair with the capricious Duchess of Alba brought confusion to his private life; the happiness and despair of this short, violent love affair are reflected in several drawings and paintings. 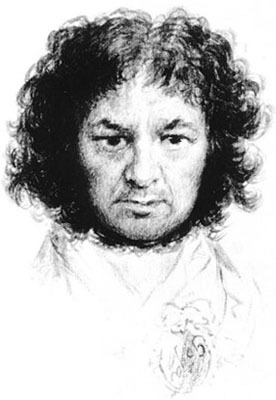 Goya, who was now approaching 50, was less prepared to tailor his art to what was expected of him. 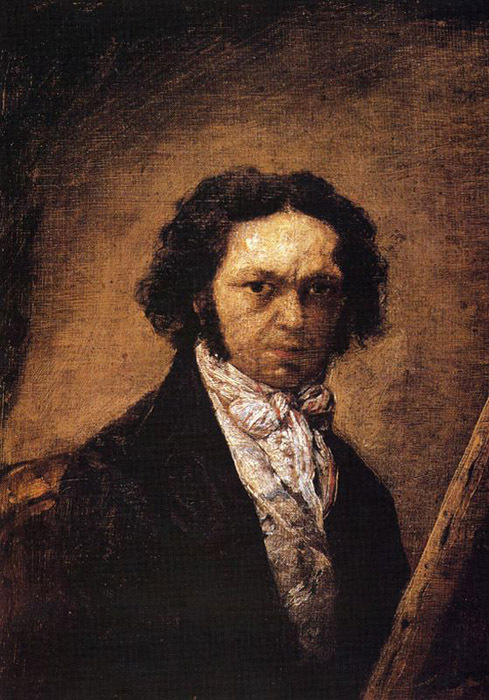 Goya stares intently at his reflection in the mirror, as though he were trying to plumb the depths of his being. After his physical and psychological crisis, the deaf Goya viewed himself and his contemporaries with a deep mistrust. 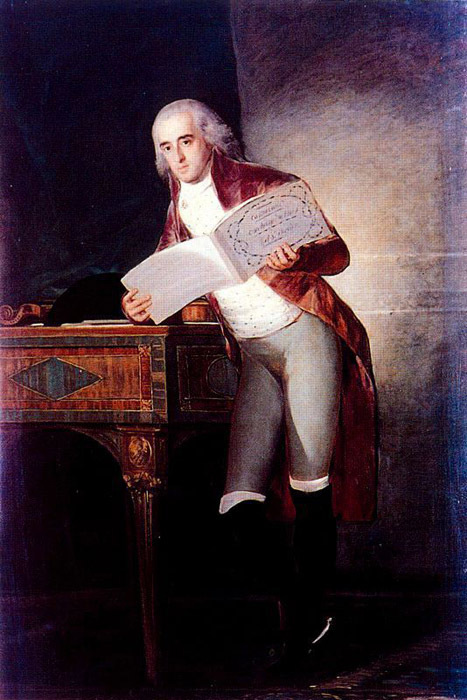 In November 1792 Coya, seriously ill, arrived at the home in Cadiz of the wealthy businessman Sebastian Martinez. He was suffering from attacks of dizziness, loss of balance, and deafness. In bed for a full two months, he was afraid he was going mad. When the crisis was over he was permanently deaf. 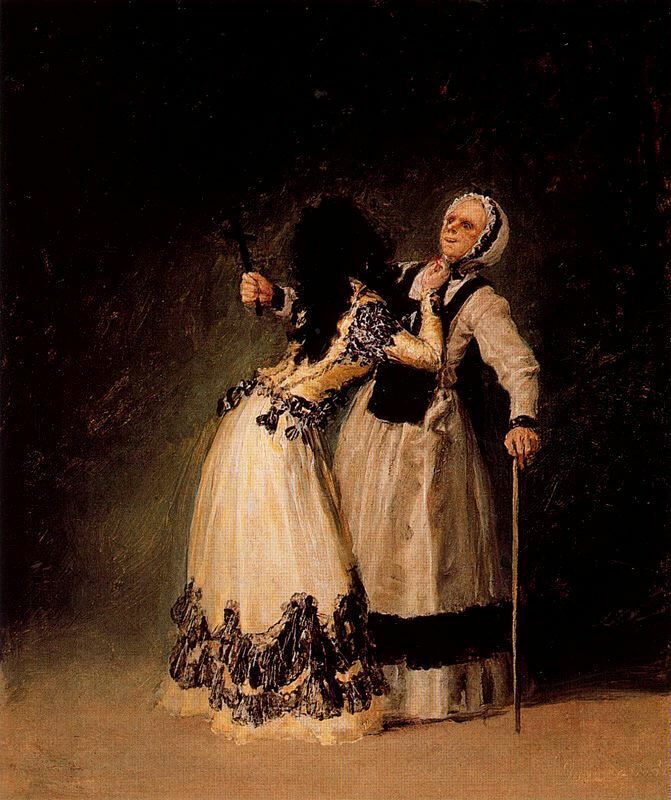 Goya's illness has never been explained; suppositions extend from syphilis to schizophrenia. It is probable that lead poisoning had a role to play, as Goya used large quantities of the highly poisonous pigment white lead, and was probably not very careful with it. In addition to this, the purpose of his trip to Andalusia remains a mystery. There are only vague references to this in the letters between his friend Martin Zapater and his brother-in-law Francisco Bayeu during his illness. In October 1792 Goya was still busy at the Academy in Madrid. He must have left the capital soon afterwards, without applying for official leave from the court. 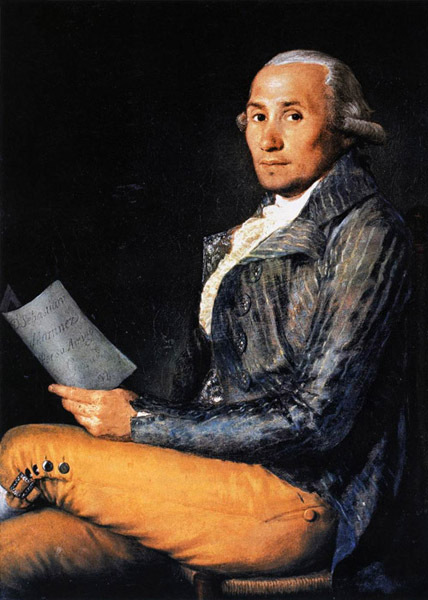 In the summer of 1793 he was back in Madrid but had neither the strength nor the inclination to work on the tapestry designs he had left unfinished. Instead, he painted a series of small cabinet pictures, without a commission, to distract himself from dwelling on his illness. It was now that he began to use personal experiences and ideas as subjects for his painting. To explain this approach, unusual at the time, he wrote to the members of the Madrid Academy that he had been able to "make observations that are generally not allowed in commissioned works, and in which caprice [capricho] and invention have free play." In these paintings he represents recollections of his journey, including bullfights and scenes from street theaters; other images show huge fires at night, a shipwreck, highway robbery, and a lunatic asylum. The recurrent theme of these paintings is the power that the unpredictable forces of nature have over man; several deal with the borderline between life and death, sanity and madness. This is where Goya's real work began, work that was to make him one of the major precursors of modern art. The painting shows the businessman as a sensitive thinker. 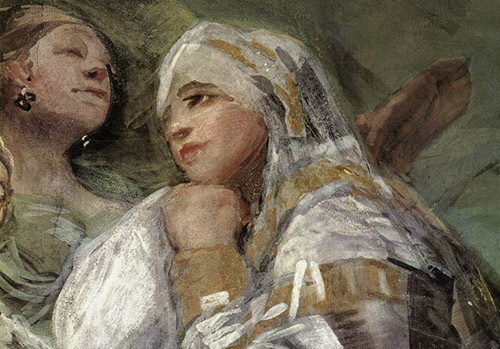 It was completed before Goya's illness, which held him captive for months in his friend's house, where he was able to study the latter's art collection. This painting belongs to the series of small works Goya painted just after his illness. 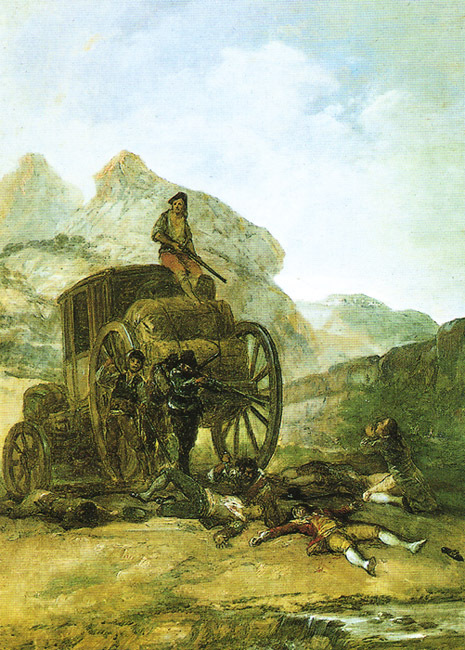 It shows highway robbers attacking a coach in a lonely mountain landscape. One of the bandits is standing guard on the roof of the coach while the others are dispatching the passengers with knives and guns. 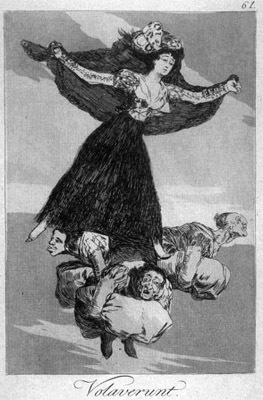 Goya may have heard about such events during his journey to Andalusia. A few years previously he had already used this subject in a painting for the Duke of Osuna. The two pictures are similar in terms of composition. But the earlier painting seems anecdotal, almost like a scene from a play. This painting, by comparison, is more realistic and conveys the true brutality of the incident more honestly. As for Cayetana, meanwhile, she was born of the heights where freedom reigned, foolishly and splendidly free of those fears that bind and torment all those who were not born to such dizzy heights. And he was full of envious admiration because she was as she was, so foolish and so fearless,.. and he was aware, at a deeper level than before, that he would never be free of the woman. She was one of the most famous and most fascinating women in Spain. A capricious beauty and a grandee of unbending pride, she was descended from one of the oldest aristocratic families in the country - the Duchess Cayetana de Alba. She became Goya's most famous model and his passionate love. 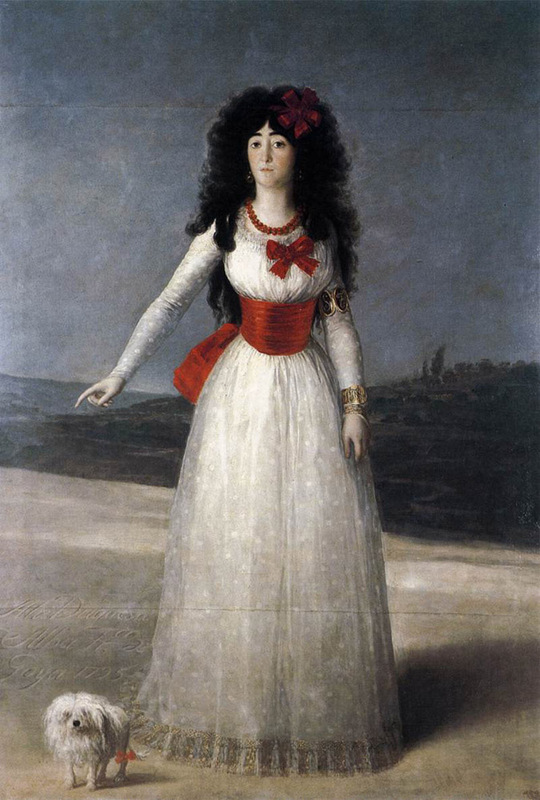 In 1795,Goya received a commission to execute full portraits of the Duchess and her husband. In a delicate white dress with a burning red sash around the narrow waist, the Duchess of Alba stands in front of a broad landscape. 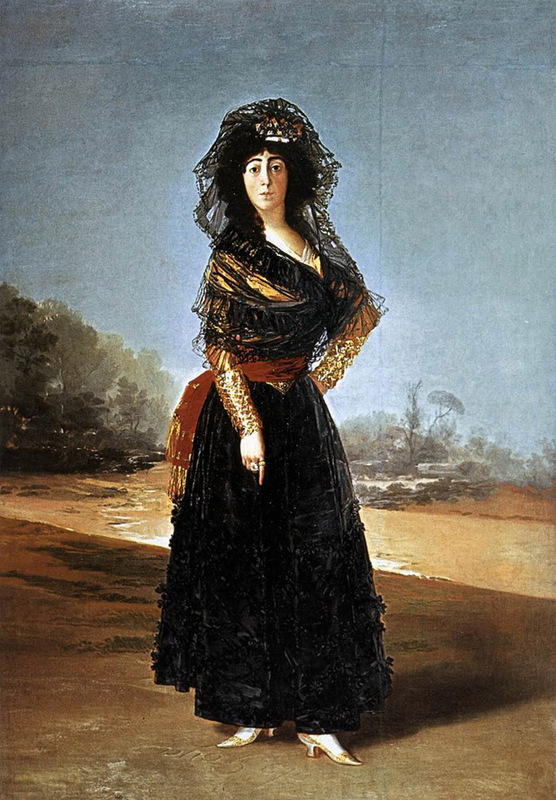 Her billowing black hair falling to her shoulders, she seems for Goya the very image of sensual beauty. It is possible that Goya fell in love with her then. Her gaze, however, is distant, almost without expression. Her husband died in June of the following year. The intense relationship between Cayetana and Goya must have begun shortly afterwards. Goya had returned to Andalusia in May 1796 to carry out commissions for the Church, to visit friends, and to study art treasures in Seville and Cadiz. The innocent trip took a fateful turn when the duchess invited him to spend some time at her country seat in Sanlucar, Andalusia, where she was spending her period of mourning. During his time with her he filled his sketchbook with drawings that give a direct insight into the happiness of their passionate relation ship. Or are these merely the results of his unrequited desire for her? The affair is disputed to this day. Spontaneous, perfunctory ink drawings show the duchess going for a walk, or lightly dressed at her morning toilet; they also show other young women captured in natural, sometimes intimate, poses. A second portrait of the duchess was executed in 1797. Again, the Duchess is standing upright, in the open air, but instead of the maidenly white, she is wearing the black dress of a maja, with a black lace mantilla framing her ivory-colored face. It had become fashionable with the Spanish aristocracy to adopt the popular style of the majas, who in their typical costume were seen as the essence of the true, unchanging Spain. The majas were famous -renowned for their pride, their unaccountability, and their great beauty. The duchess points authoritatively to the words at her feet. There, written in the sand, are the words "Solo Goya" (Only Goya). This seems like an open admission of their passion, though the consummation may well have been more a figment of Goya's passionate imagination than factual reality. The 33-year-old beauty and an aging, deaf painter... In Goya's sketchbook the relaxed, high-spirited drawings are succeeded by sarcastic caricatures and dark visions. The passionate affair became a tortured nightmare. His honor mortally wounded, Goya's drawings. and subsequently his prints, took aim at the tragicomic aspects of life -at human passion, at the coquetry, deceit and unfaithfulness of women, at the ridiculous behavior of their suitors. On page after page women are depicted as seductive witches, or indeed as incomprehensible, demonic beings. One sheet shows smirking witches carrying off a female figure through the air: her face bears Cayetana's features. This sheet bears the Latin title Volaverunt ("they have flown away"), which in Spain at that time meant "gone and forgotten." 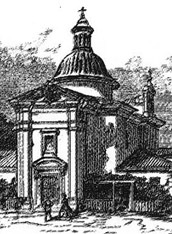 The small church of San Antonio de la Florida contains Goya's most important religious paintings. The frescoes were executed with extraordinary artistic confidence, Goya painting the figures quickly with broad, sweeping brushstrokes. Since Goya was now working for the court and aristocracy, he only rarely painted religious pictures. In 1798, however, he created his last great church fresco, for the chapel of San Antonio de la Florida outside the gates of Madrid, a chapel that belonged to the king's estate. Since time immemorial there had been, on the La Florida property, a hermitage dedicated to St. Anthony of Padua. 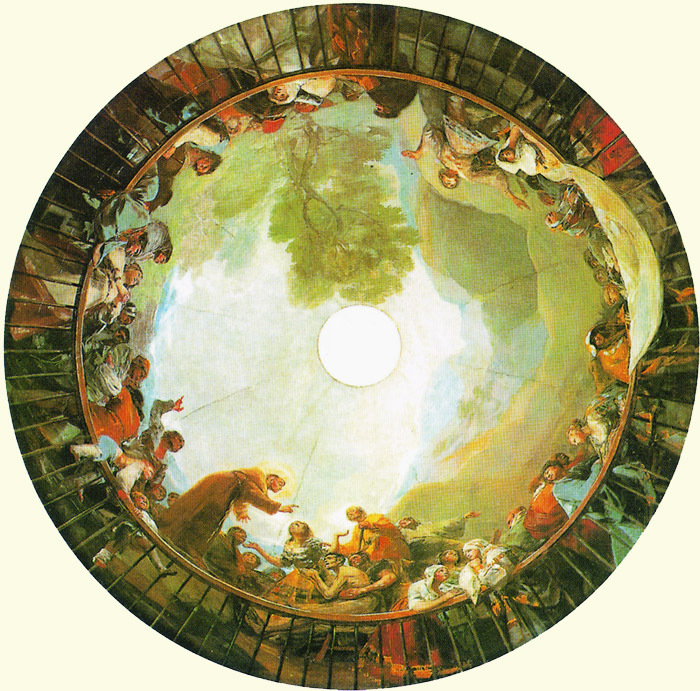 As Royal Court Painter, Goya was commissioned to decorate the chapel and vault of a newly built classical church. At the same time, he was working in his studio on the prints for his Caprichos, which made sharp satirical criticism of the Catholic Church. Goya worked on the frescoes for four months, probably supported by his assistant Asensi Julia. Today, Mass is read only once a year in this church - on April 16, the date of Goya's death. Since 1919, San Antonio de la Florida has been a Spanish national monument, and contains Goya's bones, which were brought to Spain from Bordeaux almost too years after his death. A copy of the church was built a short distance away, for the cult of St. Anthony. 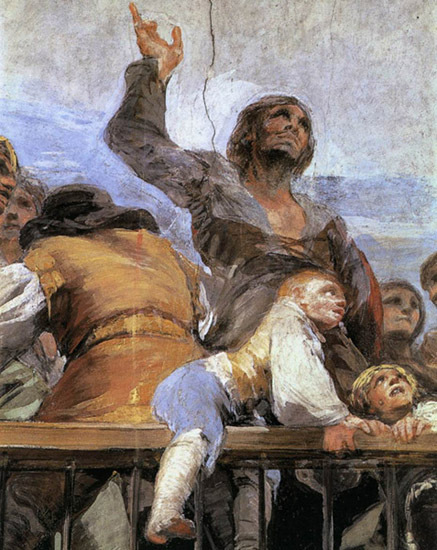 Goya decided on a composition for which there was no precedent in religious fresco painting. Till then, church domes had always been the preserve of the divine, with floating crowds of angels and a representation of God. Goya, however, painted a group of people with the craggy landscape of Spain behind them. The miraculous apparition of St. Anthony almost assumes the nature of an incident in everyday public life. down-to-earth event. The spirited figures behind the balustrade, the acrobatic boys. the pensive young women, and powerful men are rooted in the world of Goya's experience and imagination. They are not even paying full attention to the miraculous event, but are acting as they would at a public event, trying to see and be seen.